What Danny Plotnick remembers most about the Icky Boyfriends was their crowds scrambling for the exit. The combination of singer Jon Swift’s obnoxious, sing-songy vocals, Shea Bond’s punchy riffs and Bedard’s unhinged drumming garnered few fans for the garage-punk trio in 1990s San Francisco. The band counted Plotnick, by then a celebrated indie filmmaker, among a dedicated but small group of followers. Even at the bands' first show, where they opened for the Melvins to a packed house, they were booed off the stage. But a lack of wide appeal didn't stop the Icky Boyfriends from releasing several records, nor did it keep them from making their own movie. Plotnick and Bedard made I’m Not Fascinating - The Movie!, a fictionalized day-in-the-life of the Icky Boyfriends a la A Hard Days Night, in a matter of weeks. Filmed on Super 8 for around $1,000, it has a look that screams "Straight to VHS." But hidden under the nebulous colors and technical glitches is a lo-fi Spinal Tap, full of quotable one-liners and proper pratfalls. After seeing it one might be shocked to learn that it premiered to sold-out crowds in San Francisco, and toured both U.S. coasts, as well as Switzerland and New Zealand. (It's also been translated to French.) But when you learn what Plotnick and Bedard went through to make the movie, you'll agree -- the fact it's even watchable is an achievement. In 1996, the year Plotnick and Bedard made I’m Not Fascinating, San Francisco was full of danger and grit. Around 16th and Valencia, getting mugged in broad daylight was routine. Chel’s 6th St. Rendezvous, a little club south of Market where the Icky Boyfriends often played, was a hot spot for murder, if the San Francisco Chronicle’s crime maps were to be believed. But that also meant the city was cheap to live in. "In fact there was almost a reverse snobbery in that if you found out anybody was paying more than $300 a month for rent, they were immediately suspected of being a yuppie," Bedard said. Cheap rent meant Plotnick and Bedard only needed to work part-time or for minimum wage to get by, while rest of their time could go to creative pursuits. Plotnick, who came to San Francisco from Detroit, worked full-time at Video Monitoring Services, scouring news shows for mentions of their subscribers (companies like PG&E, for example). His $7-an-hour wage meant he could pay rent, make Super 8 films like Skate Witches and take them to film festivals around the country, and publish his magazine Motorbooty. 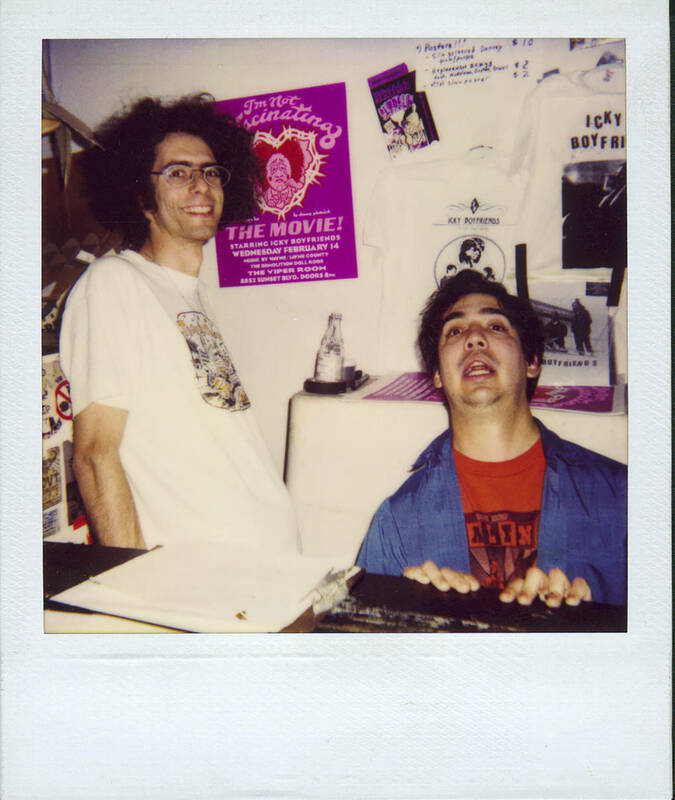 Swift, one of Plotnick's coworkers, must've figured out who Plotnick was, because one day he handed him a tape of his band the Icky Boyfriends. 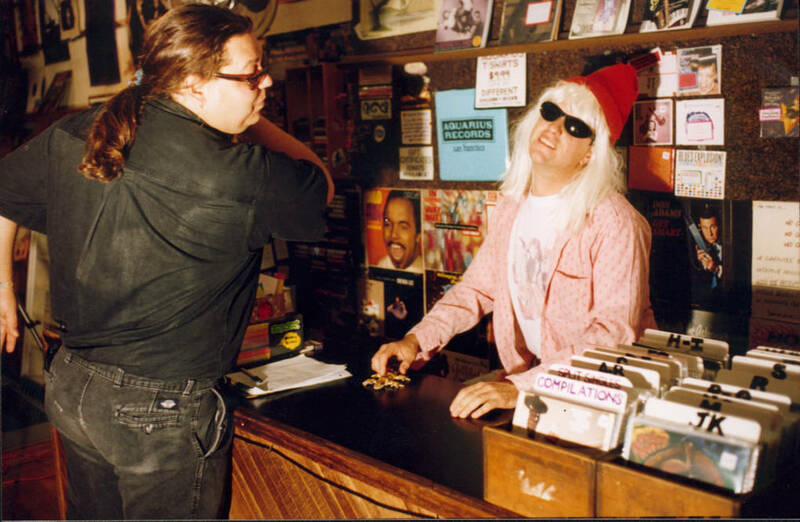 "Because I put out this magazine Motorbooty, a lot of people gave me cassettes and records. It was always a little awkward. I always feel like, 'What if I don't like it and I've got to work with this guy?'" Plotnick said. "One day I went home and I listened to it and I was blown away." Plotnick gave Swift a VHS tape of his films that included Death Sled II: Steel Belted Romeos and Dumbass From Dundas, which the band watched on repeat at their practice space in a warehouse on Sycamore Street. 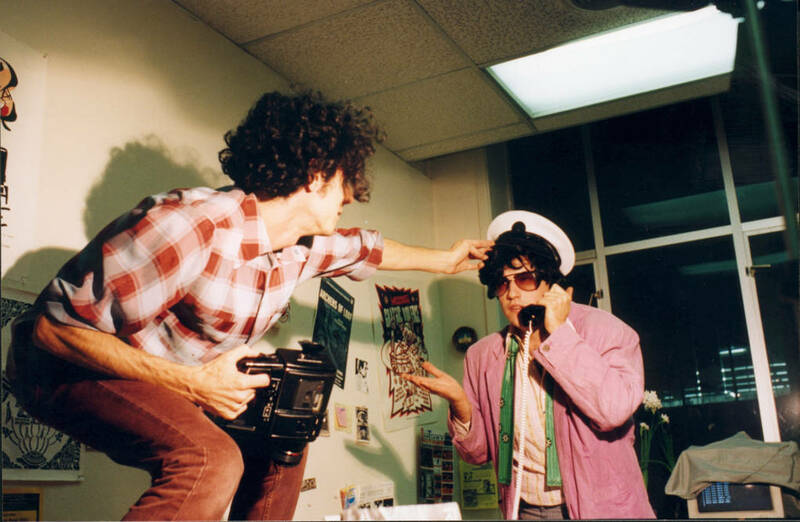 After becoming friends, Plotnick and Bedard began scheming, at various bars and shows, about making a movie starring the Icky Boyfriends. "At the time I kept a little file card box of movie ideas on index cards," Plotnick said. "I think I had a bunch of ideas written down for the Icky Boyfriends. There would be things like, 'Icky Boyfriends Ski Vacation.'" But work on the film didn't begin until 1995, when Swift announced he'd had it with the city. San Francisco was a frequent target for Swift's outlandish lyrical abuse ("San Francisco / You make me puke / Why don't you / put up your dukes"), but his frustration with the city was real. He made plans to move away from San Francisco that fall, and by the time Plotnick could start working on a script, there were only three weeks left to write and shoot the entire film. Bedard's job at the time was writing economic assessments of foreign countries for the Bank Of America, assigning letter grades to governments based on their investment potential. That summer, his manager spent his days working on a book proposal instead of his responsibilities, so Bedard took the same liberty and wrote a script during work hours, sending Plotnick joke ideas via email. "I went to look for a copy of the script and I could not find anything for the movie beyond like a two-page outline, and I'm usually pretty meticulous with all the records and ephemera that I keep," Plotnick said. "People who are actually watching this movie won't be surprised to hear about the lack of an existing script," Bedard said. The film was initially supposed to be a 20-minute short about the day in the life of the Icky Boyfriends. To start, the band would wake up together in bed under blankets made of newspapers and proceed to drink Pepsi for breakfast while discussing plans for their show that night. "I think we had come up with this waking up scene where we just saw them with their socks -- very kind of Three Stooges. Then I said, 'Well if it's a day in their life, there's got to be a breakfast scene. You guys don't happen to have any breakfast songs, do you?'" Plotnick said. "They were like, 'Yeah, we have a song called "Pepsi for Breakfast,"' and so that scene ended up writing itself." After finishing a meal of scrambled eggs with Pepsi, the guys would then go to their various "jobs": Bedard and Bond working as teachers at a comedy school (a satire on comedy traffic school), while Swift visited various women around the city who primped and preened him for taking the stage later that night. Finally, the band would play a show, where they'd be poorly received and have several objects thrown at them, yet one guy in the crowd would end up signing them to his record label -- a finale based on the real-life events of the Icky Boyfriends getting signed because of that horrific first show with the Melvins. On the third week of pre-production, Plotnick and Bedard had 60 percent of a script and they needed to start shooting. The earliest time they could schedule was that Saturday; Swift was moving to the East Coast that Monday. Then the Super 8 camera -- the one that Plotnick had used on all of his movies -- died after the first shot. "At that point it was too late in the day for me to go track down another camera. Even if there was a place open where I could rent one, we would lose another hour just going to get it," Plotnick said. "I ended up going into my closet where I had a bunch of thrift store Super 8 cameras that I hadn't necessarily used before." The backup camera turned out to be broken too, but Plotnick couldn't have known; he didn't see its faults until after the footage was processed. In the film, all the scenes with Swift have a strange flickering effect that looks like the camera operator adjusting the white balance in the middle of a shot. Production kept moving along that weekend. All three of the Icky Boyfriends flexed their improv skills to make up for the lack of dialogue, and when Bedard wasn't on camera, he was calling friends to set up locations and find more actors, hopefully with costumes. "Of course, the kind of friends the Icky Boyfriends had weren't really very busy at the time," Bedard said. With no time for rehearsal, which he'd depended on for his prior films, Plotnick was operating in new territory. But he also had Ray Wilcox and Chris Enright, the two stars of Steel Belt Romeos, which he placed in as many scenes as possible. Given a few props and free rein, both brought a high level of foolishness to their characters, such as Wilcox's portrayal of Sven, the German House music fan who could eat a hamburger and smoke a cigarette at the same time, or Enright as Mr. Past It, the record label owner with a shoddy New York accent who wore a captain's hat and sunglasses everywhere he went. But time was running out on Swift's availability. Having no formal plan to shoot the concert scene, the band found a show already underway at the Cyclone Warehouse near Hunters Point and bum-rushed it, forcing themselves on stage. "We had to find somebody holding a show and we just showed up," Bedard said. "We didn't even call. Like, we literally just arrived with the actors and the camera gear and went up to Jennifer and Lori Hall from Ovarian Trolley. We're like, 'Hey, do you mind if, in between bands, we use your show in progress to film an Icky Boyfriends concert scene?'" By the end of the weekend, Plotnick and Bedard had everything they needed for their 20-minute short. 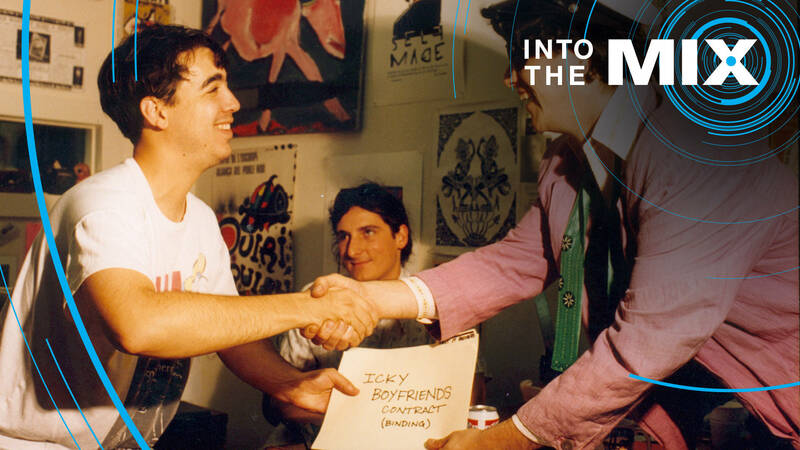 But after Swift left, Plotnick and Bedard brainstormed a whole new section of the story: the Icky Boyfriends would see great opportunities after signing the deal, only to have all the members replaced by pay-to-play musicians by Mr. Past It when he realizes that the original Icky Boyfriends are a losing proposition. Swift or no Swift, the crew shot another 29 minutes of footage, and by the time I'm Not Fascinating was ready to premiere in February of 1996, the movie was no longer a short, but a featurette. That made it difficult to submit it to film festivals, which is how Plotnick usually showed his films to the masses. How were people going to see it? They took the film on tour. 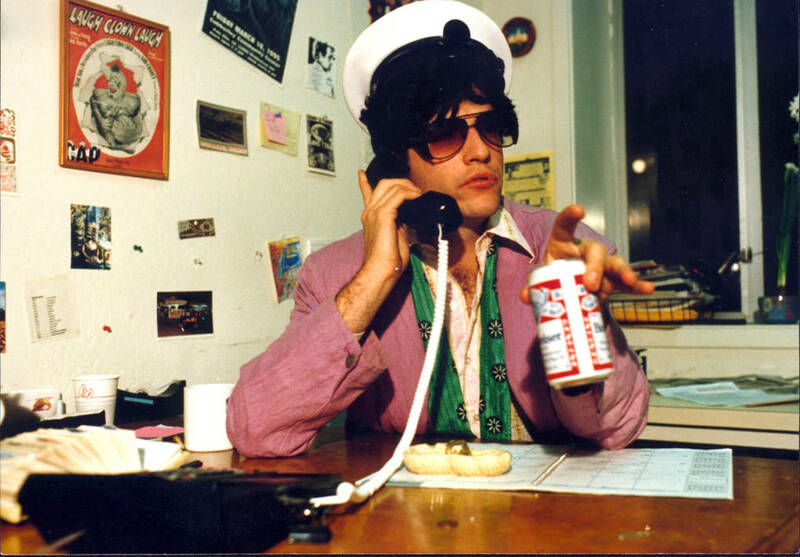 Plotnick was friends with the agent for the Demolition Doll Rods, the garage punk trio from Detroit, who agreed to put the film on as the opening act for their West Coast tour. "We actually got paid for those shows," Plotnick said. The band held a "world premiere" for the film on Valentine's Day at Johnny Depp's club in Los Angeles, the Viper Room, opening for the Doll Rods and proto-punk trans hero Jayne County. Then they brought it back to San Francisco and showed it at Artists' Television Access (ATA), with all three showings sold out. "At the time, the ATA said that was the biggest show they ever had," Plotnick said. "Between shows, Anthony and I couldn't go outside because we'd be swarmed with people telling us, 'You've got to let us in, you've got to let us in.'" 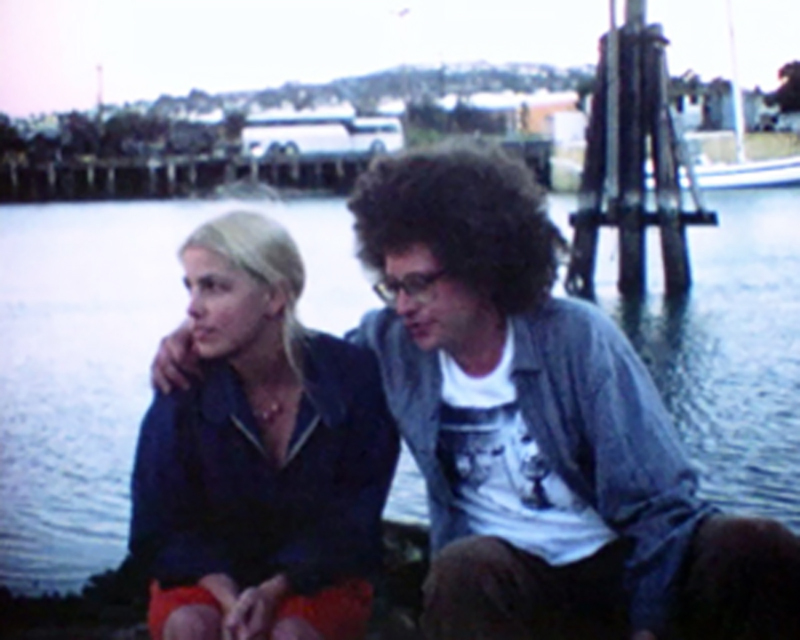 The film received positive reviews in both of San Francisco's weeklies, the SF Weekly and the Bay Guardian, with the latter praising it as "a weirdly beautiful spectacle of self-defeat." Another short residency at the Mission District club the House of Low Self-Esteem saw hundreds more come out to see the movie. Then the two had the idea to take it on a tour of the East Coast, starting with the New York Underground Film Festival -- where it played just hours before a set by jazz saxophonist Pharaoh Sanders at the old Knitting Factory -- and later hitting cities like Baltimore and Philadelphia. Plotnick toured with I'm Not Fascinating all over the west coast, taking it as far as Vancouver, Canada, and later, to galleries in New Zealand. His friend, who purchased VHS tapes for Tower Records, agreed to buy several hundred copies of it for the then-influential record store chain. But finding a place that could properly transfer the Super 8 film to VHS became an ordeal. The VHS tapes the band ended up selling featured a print of the film that didn't reflect the duo's standards. And yet, thanks to Tower's distribution, they still reached an audience. "Even just a couple of weeks ago, Shannon Shaw from Shannon and the Clams told me that she and her friend Amber from the Violence Creeps found it at a video store when they were teens living in Napa, and became weirdly obsessed with the movie," Bedard said. "There was a girl, Tamara, who found the movie in a thrift store for a dollar and was so blown away by it that she wound up starting a band called the Icky Girlfriends with these two kids who were in middle school." 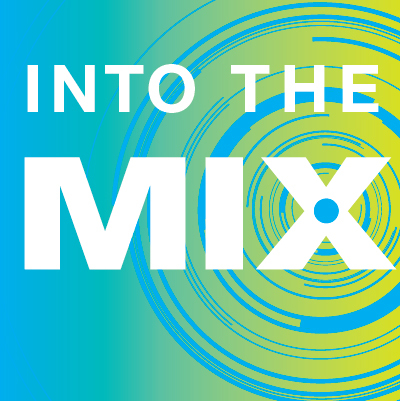 Plotnick and Bedard had a high-quality digital version of the film made this year, which finally provided them with a transfer they can proudly share with the world. 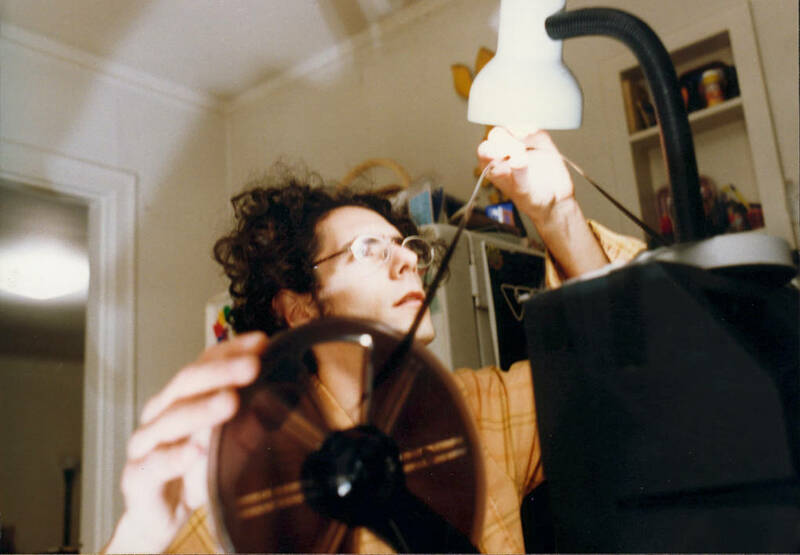 Plotnick took the film to a film festival in Switzerland last month, and there's even talk about possibly releasing it on DVD so it can continue inspiring a few and confusing the rest -- like it's always done. "Four years ago the Icky Boyfriends played Goner Fest," Bedard said. "One of the guys from the Australian band Kitchen Floor came up to me after we played and he's like, in his accent, 'Oh man, the Icky Boyfriends movie, mate, so bad, mate. I mean it's really bad. I mean it's terrible. I can't even tell you. I've seen it five or six times.' I didn't know how to take that." 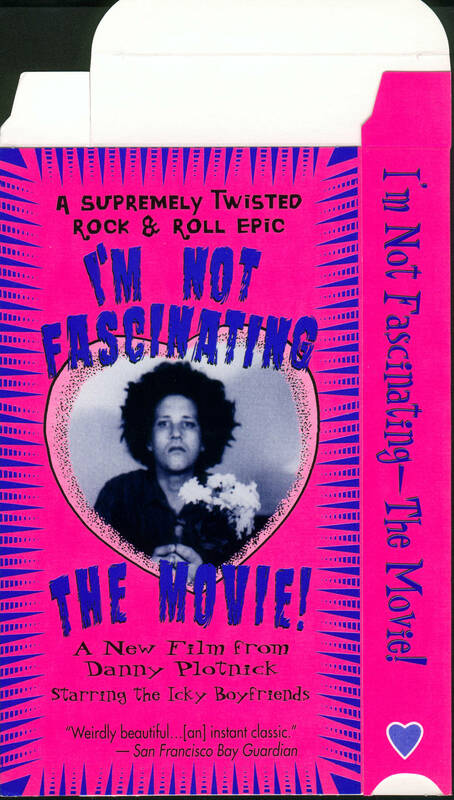 'I'm Not Fascinating -- The Movie!' screens at the Alamo Drafthouse in San Francisco on Monday, Nov. 21. For tickets and more information, visit the Alamo Drafthouse website. Bonus: Enjoy a recording of the band playing live in San Francisco in 2012.